Verdict: Preacher makes an impressive start with a confident, unusual pilot that dares to throw the viewer right into the middle of events from the get-go. Pilots are a tricky business, and in a sense they have a great deal more work to do than any other typical episode of TV. Pilots, by necessity of illustrating how a show will look going forward, have to be satisfying episodes in their own right with a complete and relatively fleshed-out narrative like a standard episode, yet they’re saddled with the difficult additional task of both laying out the show’s ensemble of characters and the conflicts they’ll face against each other and themselves in the weeks to come. A lot of the time, the dual necessities of a pilot leads to one of those halves feeling undercooked with simply not enough time to truly bring it up to standard, with a common issue of weak and thin characters or a skeletal weekly narrative failing to provide much intrigue often plaguing first episodes. Preacher, the latest comic-book adaptation from home of the ever-lucrative The Walking Dead franchise, AMC, manages to alleviate that problem – and while there’s niggles and issues that weigh it down, it’s impressive to see the show run out of the blocks having overcome problems that have weighed down dozens of pilots before it. Preacher’s pilot perhaps succeeds because it rarely behaves like a show tentatively finding its place in the world – there’s a palpable sense of confidence, verging on swagger at times evident on the part of everyone involved, a feeling that the creatives behind this have already found their vision for what they want Preacher to be. This is a pilot that firmly places the viewer in media res from the get go, inside a story that’s been running for years and examining how a particular circumstance spins that story out of control. 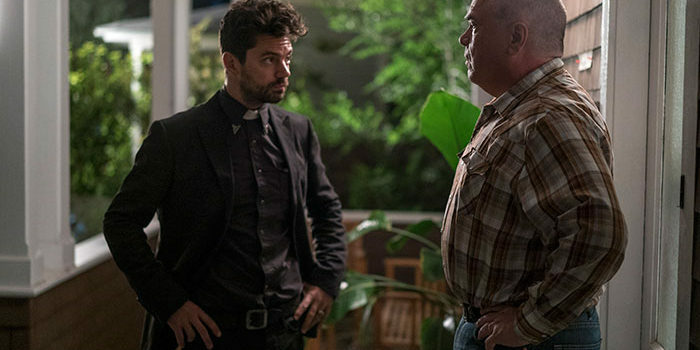 The pilot can often feel like a second season premiere – there’s an tendency to forgo the typical exposition dumps of pilots that serve to contextualise the events and provide a jumping-on point for the viewer, with Preacher frequently diving headlong into situations as if the viewer is already well acquainted with the details of the characters and conflicts. Occasionally, this habit is frustrating, and there are scenes here and there which are robbed of their impact by the reluctance to provide details, but for the most part this lends the pilot a freewheeling quality, streamlining the pace a great deal by foregoing the usual pilot tradition of leading the viewer by the hand. Preacher’s pilot may not reach true greatness, but it’s invigoratingly unusual in its approach to setting up the characters and conflicts that’ll play out for episodes and possibly seasons to come, and that’s certainly a refreshing thing. The second-season approach comes across most clearly in the introduction of the three central characters who take up the lion’s share of screen-time here: Jesse, Cassidy and Tulip. These are the integral figures whose portrayal was absolutely vital to Preacher’s success, so thankfully the pilot makes a good start with their characterisation. It’s notable how well Preacher uses action scenes, even if they’re relatively sparing in length, to establish character and inform the viewers of hidden depths in ways that are far more entertaining and dynamic than an expository talk that would reveal the same characteristics. For example, Cassidy and Tulip both get their own terrific fight scenes as introductions – these scenes are both flat-out excellent pieces of action filmmaking with kinetic, gritty cinematography and important character scenes, densely packed with information that expand viewer’s understanding of who these people are from the get-go. All it takes is these brief action scenes to really establish Cassidy and Tulip as vital, engaging characters with a propensity for violence and a slightly unhinged edge, allowing for the rest of the pilot to effectively build upon these foundations while never allowing them to subsume the central character arc of Jesse as the main focus. As Cassidy and Tulip, Joseph Gilgun and Ruth Negga are a hell of a lot of fun, instantly slipping into their twisted personas with barely a touch of trepidation in a way that enhances the effectiveness of the choice to throw the viewer right into the middle of these characters’ stories – Gilgun and Negga feel like they’ve been playing these characters for years right off the bat, and I’m really intrigued to see how they build off these excellent introductions as the broad characterisations become more nuanced in following episodes. Jesse’s arc is a bit more of a slow-burn, so there’s less of the sense of instant gratification and fun that Cassidy and Tulip’s introductions provide. Yet Jesse’s development becomes a compelling part of this pilot due to the meticulous construction of how he’s revealed to the viewer. Starting with the façade of the inept preacher trying to live up to his father’s name, the pilot studiously peels away the layers of deceit, chipping away and undermining that initial image of the good son living up to his father’s promise until the true, ugly core is revealed – and only then does the pilot give Jesse a brutal fight scene to match Cassidy and Tulip’s, a scene laden with intriguing touches such as his smirk in the midst of the brawl and gratuitous brutality at the end. Dominic Cooper accompanies this layered character arc with a similarly multi-faceted performance that’s constantly conveying two or three very different things at once, such as compassion tinged with regret tinged with raw intensity, compellingly portraying Jesse’s volatile conflict as he’s pulled between two drastically different destinies. While this arc may test patience at times with its diversions to less interesting conflicts such as a strange subplot involving domestic violence that turns out to be a sadomasochistic relationship, it pays off at the end because it really allows the viewer to get a sense of Jesse’s turmoil and the deception that clouds his life before the show pulls the trigger and gives Jesse his powers. That’s instantly a more intriguing idea than simply quickly introducing him and powering him up early on, because it allows for Jesse to be pushed to a place where his new abilities will actively enhance what we already know, factoring into fleshed-out conflicts and character arcs that have played out for almost the entire episode and thus knocking them off course in a way that completely throws everything up in the air. In essence, the smart construction of this pilot that keeps powers off-stage until very late on allows for Jesse to come first in every sense – he doesn’t feel like a character purely created to be given powers with no other purpose to his creation with the abilities merely a secondary facet, a testament to the good work of both the script and Cooper’s patient performance. Perhaps the chief flaw with Preacher’s pilot is that it does feel like three or four shows thrown into one at points – the aforementioned brash tendency to barrel into situations leads to a bit of tonal disjointedness as times as drastically different situations are packed closely together. For the most part, all of these situations are individually interesting – the absurdist violence of the exploding religious figures, the travails of the world’s friendliest teenager, Eugene aka Arseface to name a few, but the balance isn’t always struck, and this reviewer was certainly left with a sense of bewilderment at times at scenes that careered wildly between tones and genres. There’s a fine line between feeling agreeably unusual and subversive and being downright messy, and while Preacher stays on the right side of that line for the most part, there are certainly signs here at indicate that there may be a bit of trouble going forward in reconciling the bizarre wackiness of the comic with the necessity for a TV show to be grounded in tonal consistency. At times, the ensemble also becomes a little thin when the pilot has to service the main characters’ story, leading to the pilot leaning on minor characters such as the Civil War re-enactor and Jesse’s assistant at the church who aren’t particularly engaging due to how they’re restricted to one or two basic characteristics. There’s time to flesh out these outer characters and make them interesting in their own right in future weeks, but purely on its own, the pilot spends a bit too much time doing a bit too little with characters who feel like plot devices who blink out of existence the moment they stop affecting the main characters’ story. The cast has a pretty solid genre pedigree – Dominic Cooper is a veteran of the MCU after starring in both Captain America: The First Avenger and Agent Carter, while Ruth Negga played a recurring role as Inhuman Raina in Agents of SHIELD. Interestingly, both Negga and Gilgun starred on UK superhero show Misfits, though not at the same time. True to form for AMC, there wasn’t a bit of major profanity to be found here, although the ultra-violent spirit of the comic was more or less kept alive, especially in the ‘open your heart’ scene, which took a disgusting idea and ran surprisingly far with it. RIP, Preacher universe Tom Cruise. So, who are the folks stalking the spirit that’s possessed Jesse? All we know is that they have both impeccable tracking skills and a weird teabag-eating habit. I suspect these are more starter villains than anyone who will greatly contribute to the mythology, but we’ll see. Louis Rabinowitz is a British online writer, and a fan of all things superhero and sci-fi. His favourite show is, and probably always will be, Doctor Who, but he also enjoys shows like The Flash, Arrow and The Walking Dead. Never ask him who is favourite superhero is, unless you have an hour or two free while he decides. Follow him on Twitter at @Rabinovsky.